Hong Kong – city brimming with people, skyscrapers and breathtaking mountains. It is the fourth most densely populated ‘country’ (according to China) in the world. If you head to the Kwun Tong District in Hong Kong you will be one of 57 250 people within a square kilometre. With that many people, you would think it would be pretty easy to open up a food and beverage (F&B) joint due to the constant demand for food. 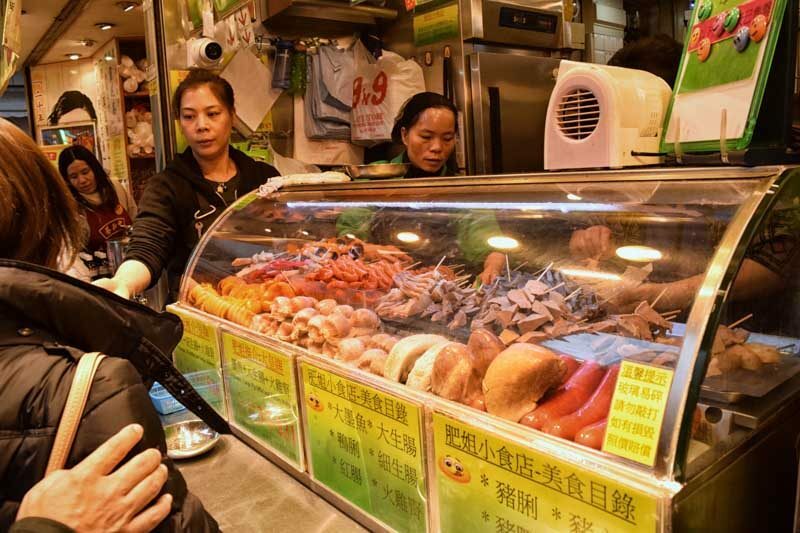 But, forget about the difficulties of surviving the turbulent F&B marketplace in Hong Kong. You just have one question. Fret not, we have scoured the corners of the city and “da food” will now be at your fingertips. We have split the food into 4 main categories. Yum Cha, Dai Pai Dongs, Cha Chaan Tengs and Street Snacks. Let’s escape the ordinary and be adventurous, come with us as we swallow everything that this bustling city has to offer. ‘Yum Cha’ when directly translated means to ‘drink tea’. 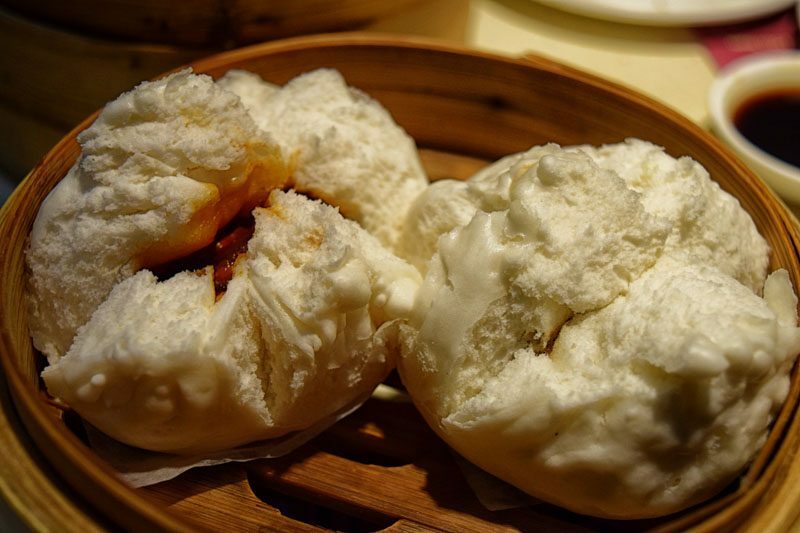 A Hong Kongese pastime, the drinking of tea is often accompanied with a plethora of dim sum dishes and other snacks. 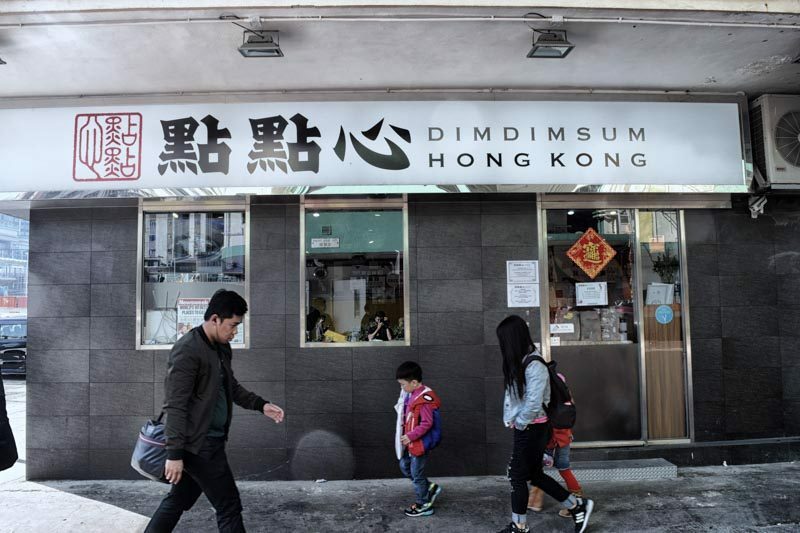 So where did we head to, to get our authentic canto dim sum fix? Bring that book along that you have been planning to read. We waited for about an hour (on a weeknight) before we could sink our teeth into any dim sum, authentic or not. If you are lucky, you will be able to sink your behind into a row of plastic stools placed along the sidewalk for hungry patrons. We suggest you arrive here at 3pm on a weekday if your patience wears out faster than it takes Steph Curry to sink a three. The wait, was most definitely worth it. With pillowy char siu baos (14 HKD), silky smooth chee cheong fun (HKD 20) with sweet and gooey BBQ pork stuffed inside, your tastebuds are bound to be working overtime. 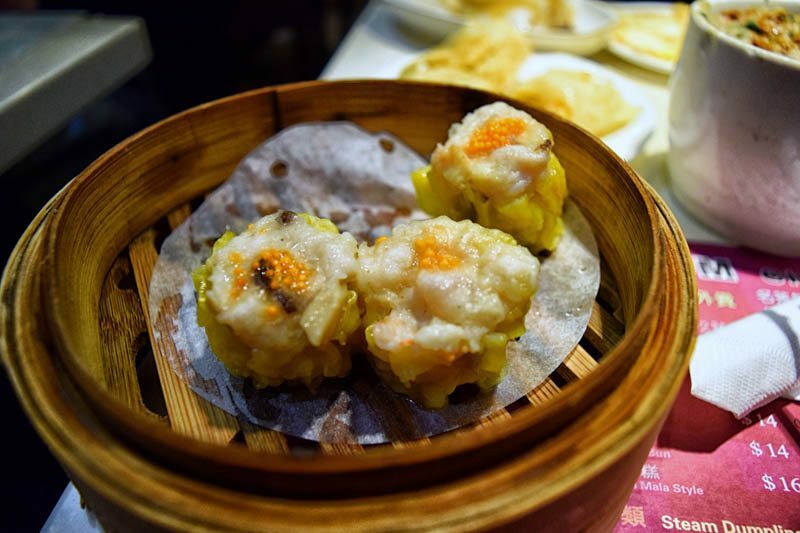 Pair that with a braised chicken claw and pork ribs served with rice (24 HKD), springy siu mai (HKD 24) topped with prawn roe, your yum cha meal is going pretty well. We do advise getting there earlier in the day as the best dish on the menu (the baked bbq pork buns) were sold out by the time we got there. Even though restaurant has been awarded a Michelin Star, the damage to your wallet will be bearable. With each dish going at approximately 18 HKD, order accordingly to your budget. We definitely recommend coming here with an empty stomach and at least 4 people so that you can order most of the different dishes on the menu. I guess it takes a mouthful to get a mouthful of silky, crispy, sweet and savoury dim sum over here. 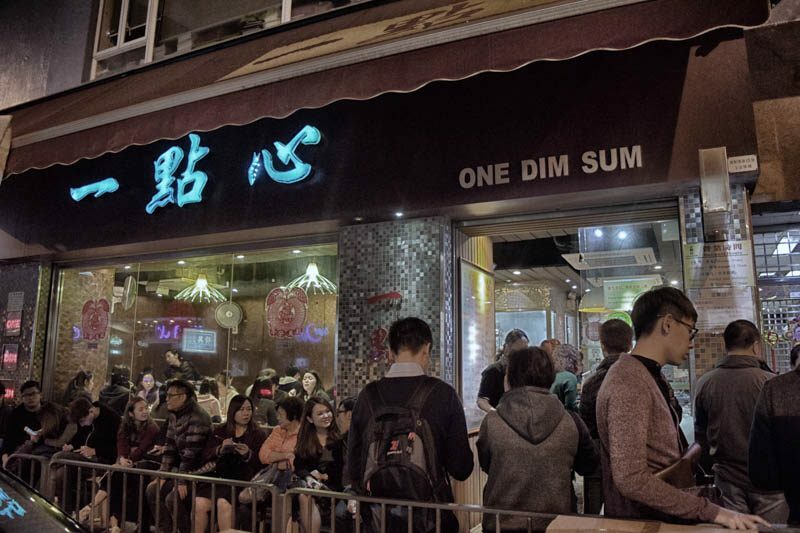 Compared to One Dim Sum, they have a few more outlets, allowing patrons to get a bite wherever they are in Hong Kong. The outlet in Jordan is the most efficient and effective in getting you to that blissful food coma you crave. We sampled most of the dishes which we felt were unique to Dim Dim Sum, and boy were we in for a treat. The piggy custard buns (20 HKD), which we tore into first, had copious amounts of custard flowing out. The buns were soft and chewy, complementing the heavenly custard inside. We decided to try the crispy rice rolls with shrimp (27 HKD), opting for something different. There is a thin layer of deep fried batter within the rice roll itself, which might be blasphemy to some BUT WE LOVED IT. Combining the two textures in our opinion was nothing short of genius. 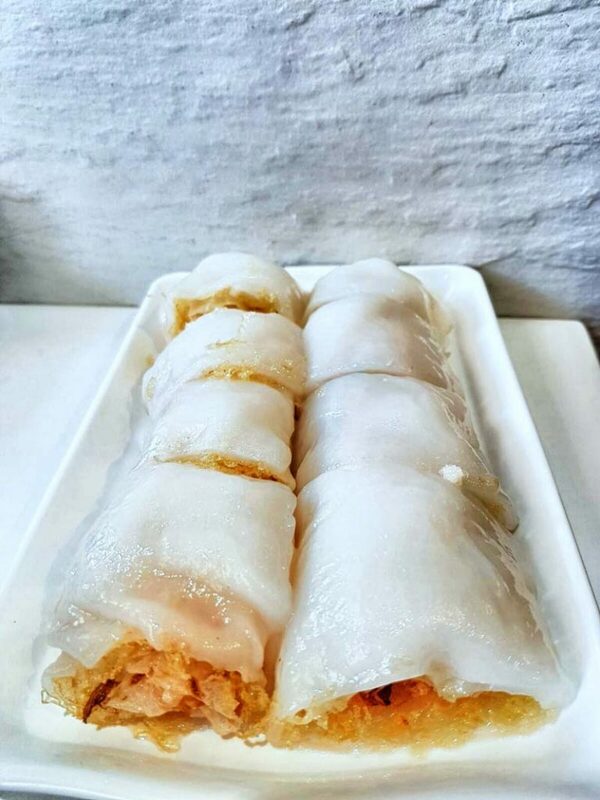 The thin film of rice roll covered the crispy deep fried batter and encapsulated the subtle sweetness of the springy shrimp within. Mind. Blown. Tongues. Wagging. 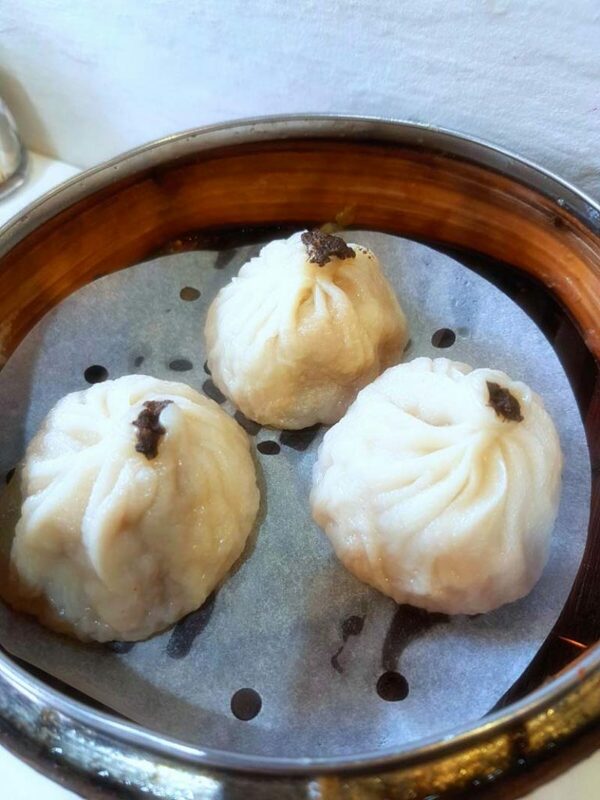 We felt that the Xiao Long Baos topped with black truffle (22 HKD) could be given a miss in comparison to their other dishes. The three scintillating towers covered in teriyaki goodness were the best things on the menu. Pan-fried eggplant (ew?) 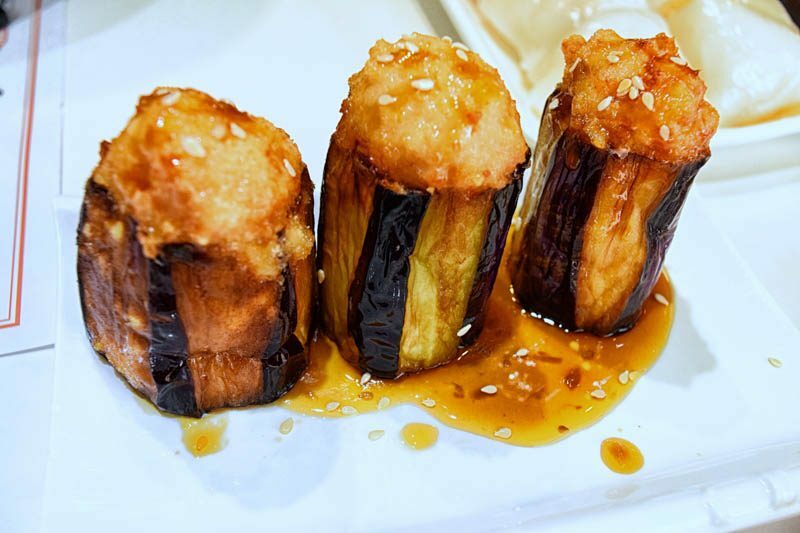 stuffed with shrimp balls covered in teriyaki sauce(21 HKD). Were we still in a dim sum restaurant? Trust me, as a habitual non-vegetarian, I was equally shocked when I fell in love with this dish. The eggplant is crispy on the outside and delectable everywhere else. They sprinkled sesame seeds like salt-bae would salt and we loved every single bit of it. The shrimp ball brought the dish to the next level. Seriously, just take our word for it and try it, even if you hate eggplant. You will love this. Do you even Dai Pai Dong? Think push cart stalls with loud hawkers along a crowded alley. The literal translation of a Dai Pai Dong would mean “restaurant with a big license plate”. When the Dai Pai Dong licenses were initially issued to relatives of deceased civil servants after World War 2, their photo’s were required to appear on the license, thus their licenses were bigger than normal restaurateurs. 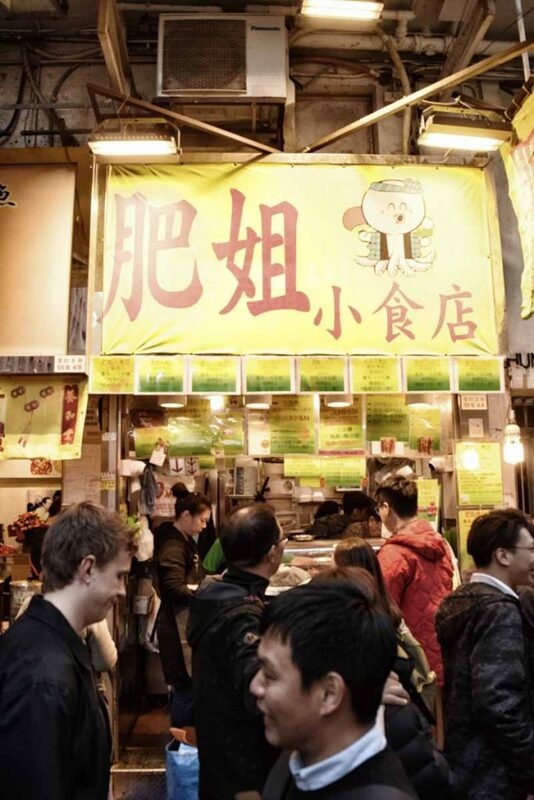 This simple act earned these open-air food stalls their namesake. We literally scoured most of Hong Kong to find this Dai Pai Dong. Though now it had a roof above it, it still maintained its authenticity by serving us great food for a cheap price. Being a noodle stall, here you get to pick 3 meats/sides to accompany your noodles (28 HKD). They give you a choice of noodles, but surprisingly, instant noodles will cost you an additional 2 HKD. We wanted to choose more than 3 sides with our noodles and our bowl cost us 38 HKD. The best part about this bowl of noodles was honestly the soup. With a broth that was stewed for just long enough, the array of meats perfectly complemented it. The noodles were extremely soft and springy as well. The pigs intestines were the right amount of chewy and braised just right. If you are ever on a budget and need some good food, this is the place to go. 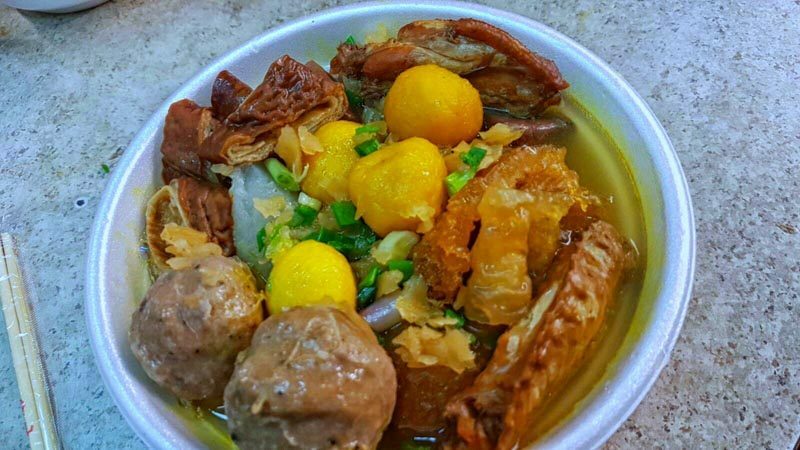 The Dai Pai Dong is a huge part of Hong Kong’s culture that is unfortunately on the verge of extinction. 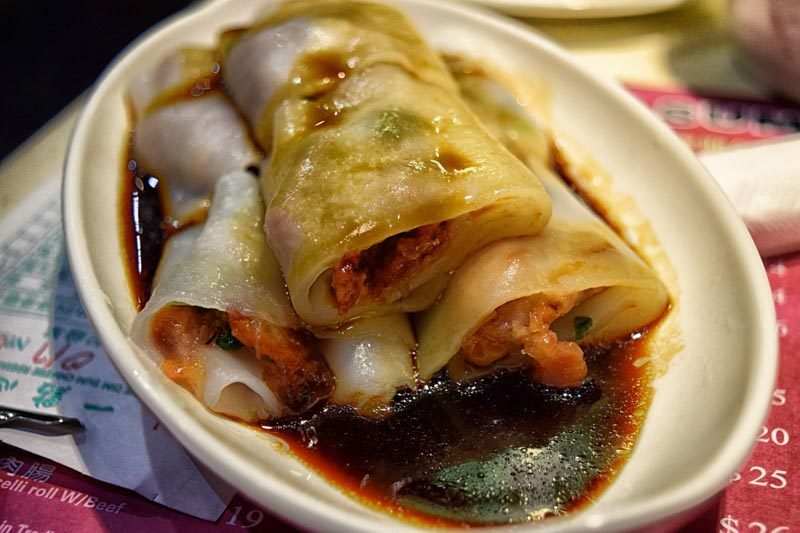 There are currently only 28 licensed Dai Pai Dongs left in Hong Kong. With majority of them in Central and Tsim Sha Tsui, we highly recommend you get a taste of this cultural dinosaur before it leaves Hong Kong’s shores for good. Shall we do the Cha Chaan Teng? Literally translated as ‘tea restaurant’, they tend to serve you up a history lesson with every dish. 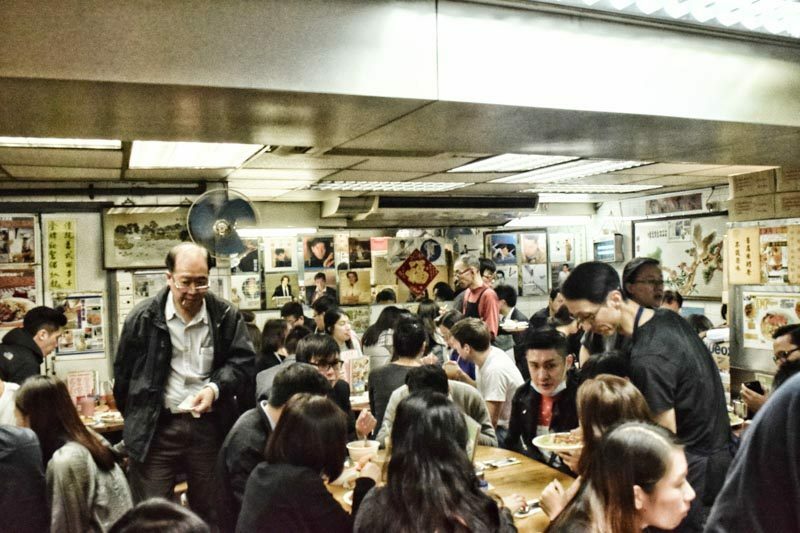 The Cha Chaan Teng symbolises the blurring of boundaries between Cantonese, British and Portuguese cuisine. 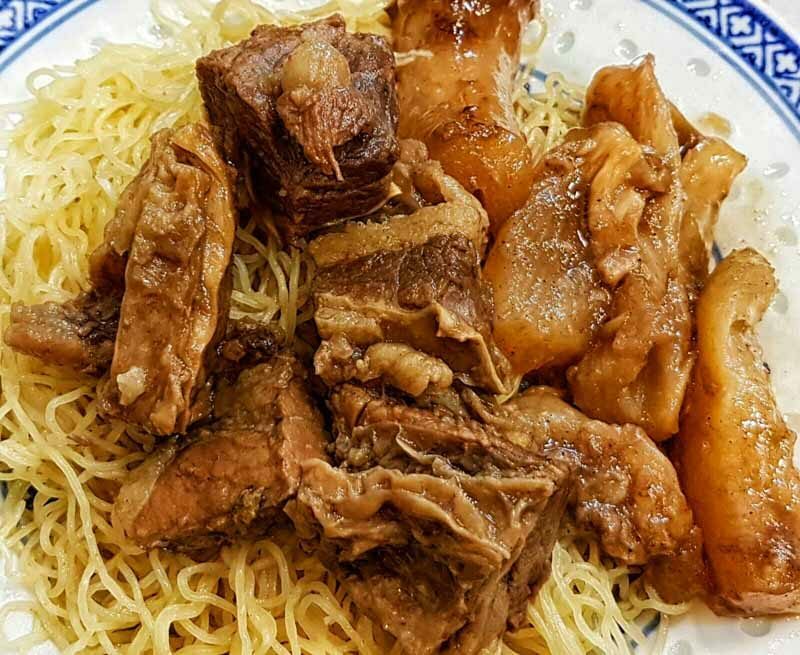 Cha Chaan Tengs have gotten incredibly famous over the years, partly because of their extensive menu, but also due to their affordable prices. 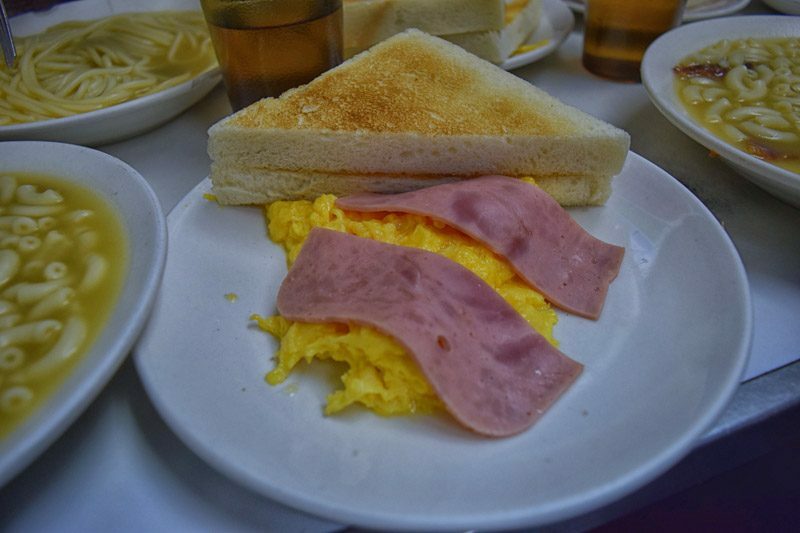 You can expect to eat comfort food like macaroni soup, french toasts served with a slab of melting butter, egg tarts, pork chop and scrambled egg sandwiches. Order a set meal and you might be treated to a free flow of Hong Kong style milk tea and coffee. Be sure to take a sip of the Yuen Yeung, which is a mixture of 70% milk tea and 30% milk coffee. Creativity is not lacking within the Cha Chaan Teng community. Do not be confused, this place is not Australian and they do not only sell dairy products. This is one of the most famous Cha Chaan Tengs in Hong Kong. We head there on a Saturday morning and we were greeted with a queue of at least 75 hungry people. Surprisingly, we only waited for 20 minutes before we were ushered indoors by an angry waiter. We ordered their lunch set, which included macaroni soup with either beef or barbecued pork, scrambled or 2 eggs sunny side up with two thick toasts lightly smeared with butter and a beverage of your choice. We were set back only 43 HKD by this meal. The scrambled eggs were just the right mix of creamy and fluffy. They might just be the best in Hong Kong. We felt the macaroni soup was a bit of a let down, with it being a tad too salty. Since we had queued for so long, we decided to order more food midway through our meal. We ordered a french toast (18 HKD) and an egg custard stewed in Chinese style (20 HKD). It was at this point where we realised that our drinks had not arrived yet. When we tried to point this out to the waiter, he let out a spew of cantonese and then said, “You no order drink”. We tried to explain to him that we had ordered a set, pointing to the menu but he insisted that we had not. In the end, we gave in and told him that we had not, this being the only way to get our drinks. Thankfully, the french toast and custard were served without any hiccups. The french toast was heaven on a plate. 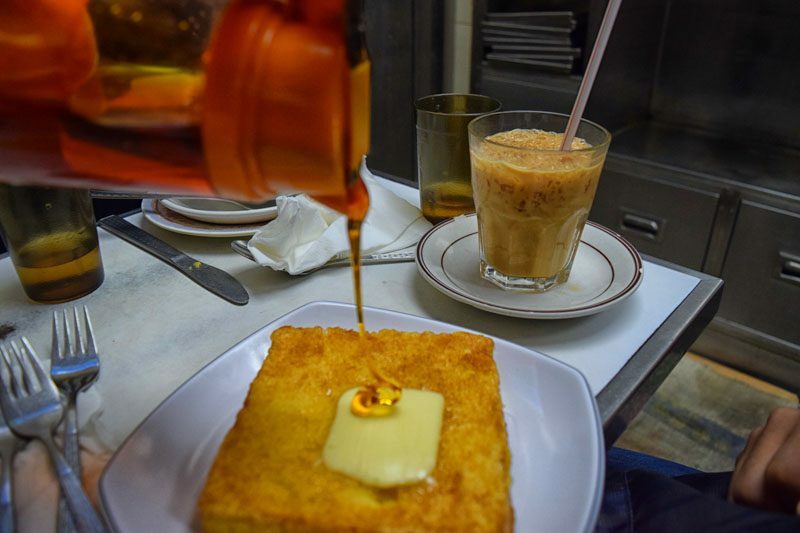 It came with a thick slab of butter and a pot of honey for you to drizzle over the steamy toast. 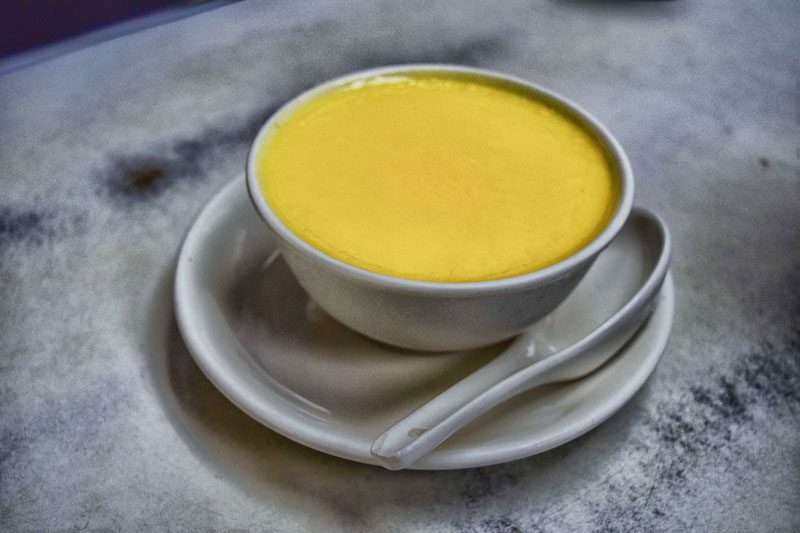 In my opinion, the steamed egg custard was not worth the hype. In fact, the steamed milk at Yee Shun Milk Company was much better. 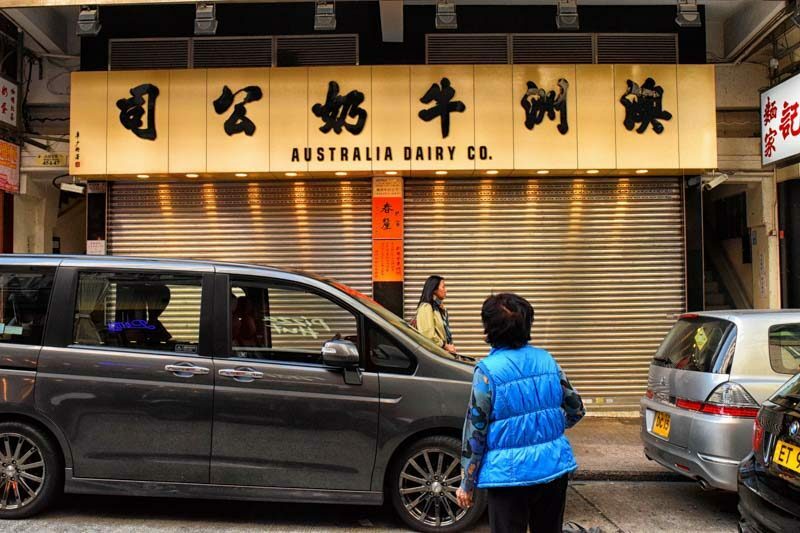 A primed competitor of Australia Dairy Co., this Cha Chaan Teng is here to stay. As one of its branches located across the street from ADC, this is a Golden State Warriors vs. OKC kind of rivalry. 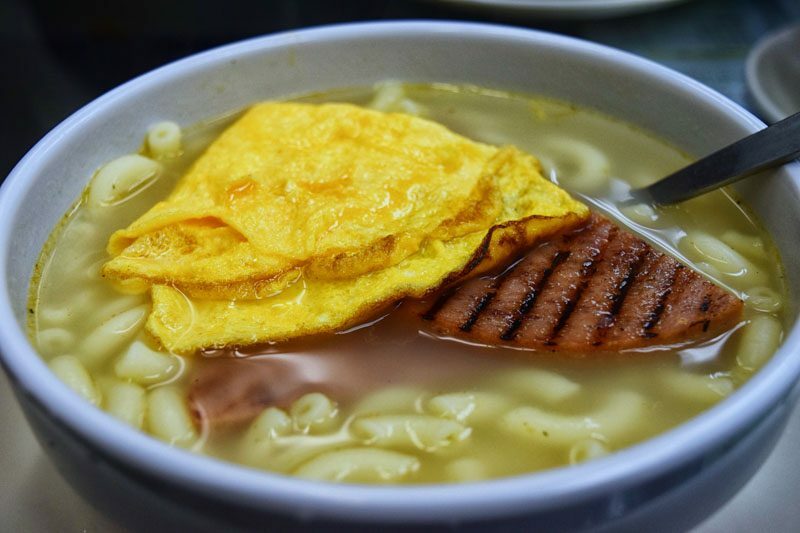 We ordered the macaroni soup with luncheon meat and scrambled eggs (37 HKD). 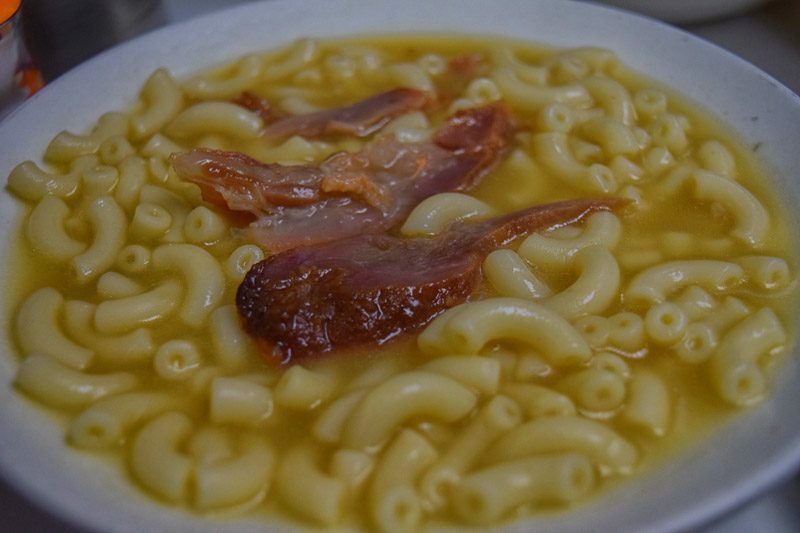 Similarly priced to ADC, we found their macaroni soup much better than ADC’s. However, their scrambled eggs paled in comparison (they had dumped it in the soup??). 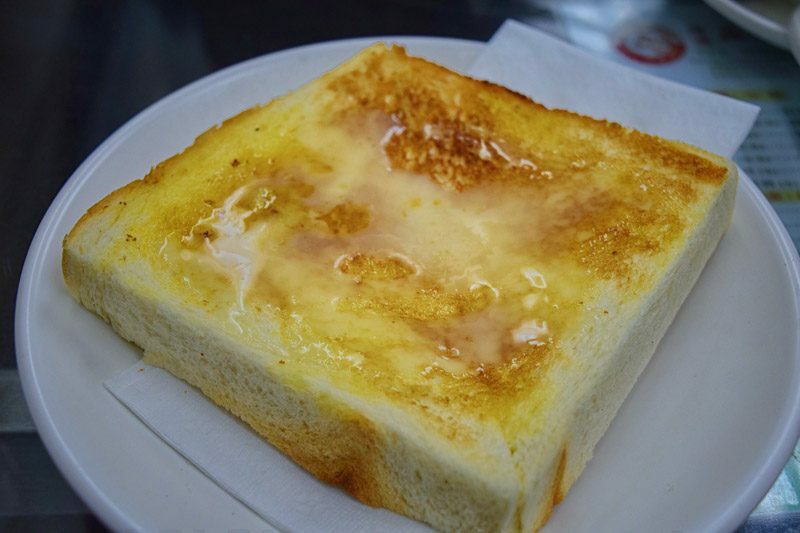 We also decided to order condensed milk toast (The star of the afternoon was the steamed milk (so good we literally couldn’t wait to dig in). The pudding was light yet incredibly rich in its flavour. Demanding a price of 31 HKD, it is slightly overpriced, but so, so worth it. With the service here much better than that at ADC and with shorter queues, if you are in the mood for some amazing steamed milk, head down to Yee Shun Milk Company instead. The elder Mak who had started the first Mak’s noodles had apparently served them noodles to Chiang Kai-Shek himself! That is how good these noodles are. With a lot of hype around them and the stall at Central, we decided to try the one at Jordan to see if it was any good. 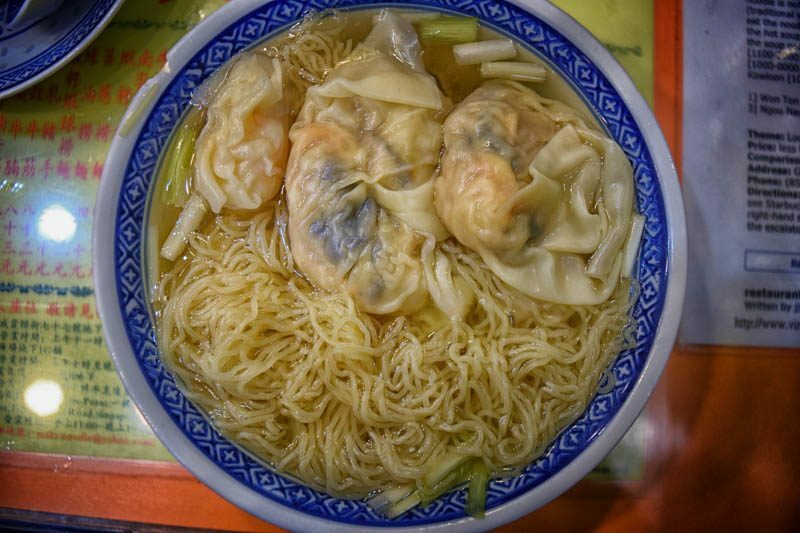 We tried the beef tendon and beef brisket noodles (45HKD), as well as the wanton and dumpling noodles in soup (48HKD). The beef tendons were succulent and actually melted in our mouths. The brisket was not too stringy either, with the right amount of fat attached, to make us feel like we needed to hit the gym soon. The highlight? Definitely the dumplings. If I could only eat one thing for the rest of my life, Mak’s dumplings, all day err day. They do not scrimp on the shrimp over here. The skin is thin enough for you to see all the ingredients within. They add minced pork, a full shrimp, bamboo shoots and mushrooms into this dumpling from God. Trust us when we say this is the best dish on the menu. If this wasn’t enough, we realised there were wantons too in our bowl too. Once again, the thinness of the skin amazed us, how was it even being held together? The shrimp within seemed like it had been infused with a light nectar, its subtle sweetness drawing us in. Although the portions here, tend to be on the smaller side, we walked out happy campers with our tummies smiling from love handle to love handle. Maybe we should not have had the soy bean milk (5 HKD), but we could not resist! With a slight nutty flavour, we could not be more pleased. Verdict: Mak’s Noodles at Jordan, worth the visit. 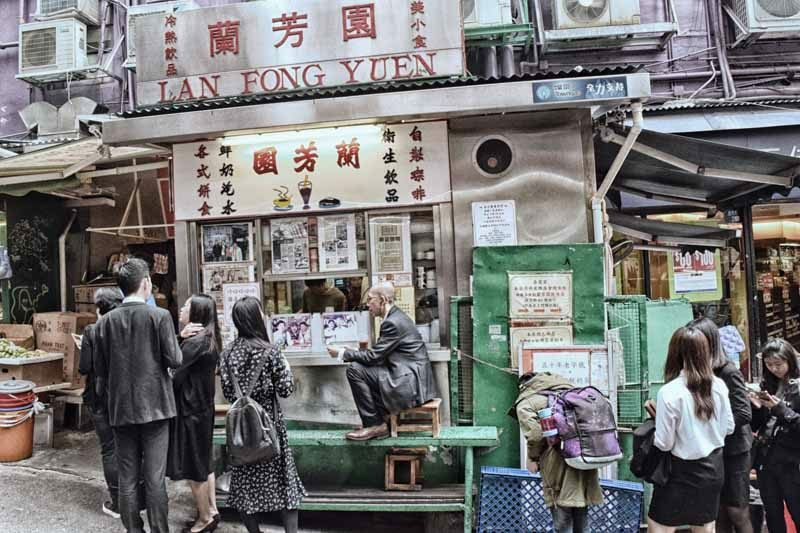 It is rumoured that Hong Kong’s famous Yuen Yeung (Coffee and Tea), was ideated here. As highly unlikely as that seems, their Yuen Yeung (16 HKD) is pretty damn good (do not get it iced). If you were to head there around lunchtime, do not get intimidated by the queue. They tend to chase customers out as soon as they have almost finished their food. Their hustle here is real. 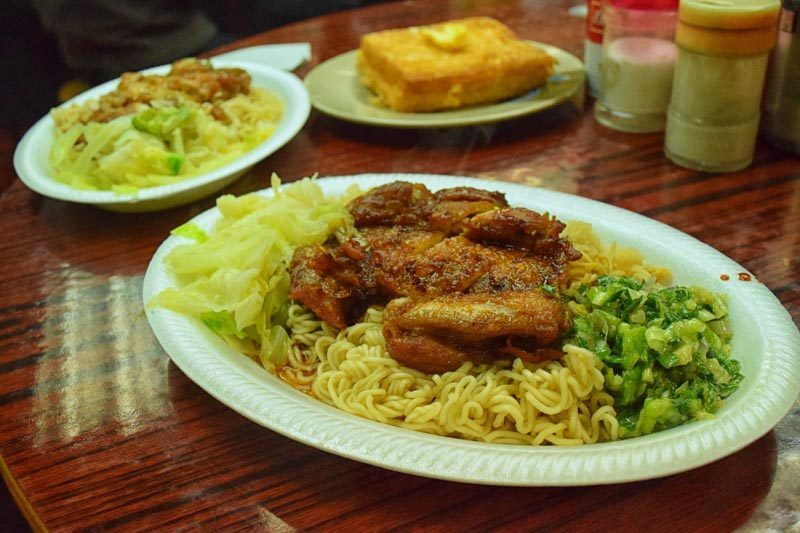 We were recommended the pan-fried chicken chop served with instant noodles and a spring onion sauce. It set us back a meagre 31 HKD. The chicken chop was done surprisingly well, glistening and steaming as it came right out of the pan and into our plate. The noodles were mediocre, but we felt the spring onion sauce made up for the noodles’ inadequacy. Be sure to mix it in well, you will achieve salty nirvana with every bite. Their french toast was above average, unfortunately it cannot compare to that of Australia Dairy Co.’s. Do not expect good service from this understaffed place, but expect cheap and good food. The locals that eat here are generally friendly, many of them offering to help us out with ordering the best dishes. The crowd here is ecclectic, from bankers in thousand dollar suits, to teenagers that look like they aspire to work for hypebeast. 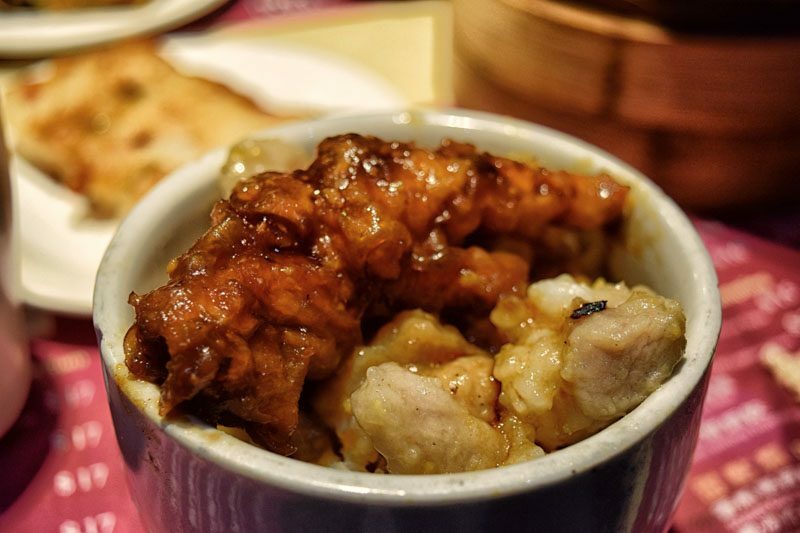 It seems like everybody needs some cha chaan teng in their lives, no matter what they do. 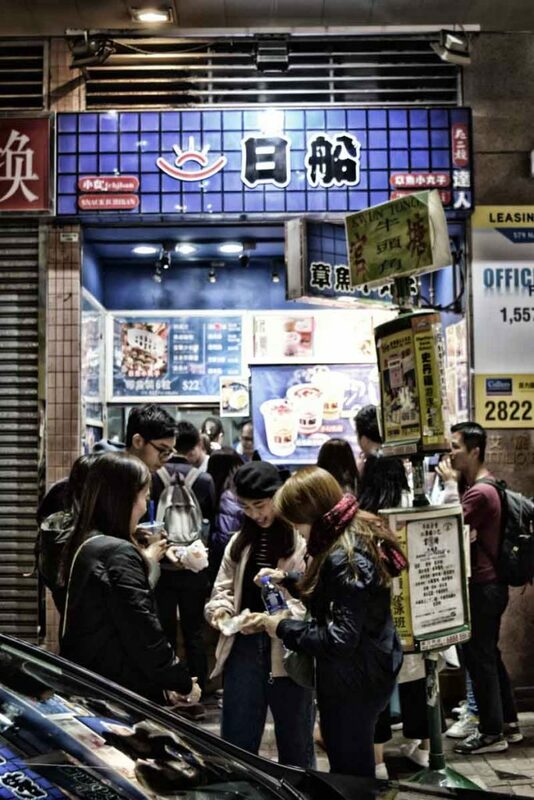 One tip, their pork chop buns (17 HKD) are supposed to be pretty good, and are starting to gain traction with many. 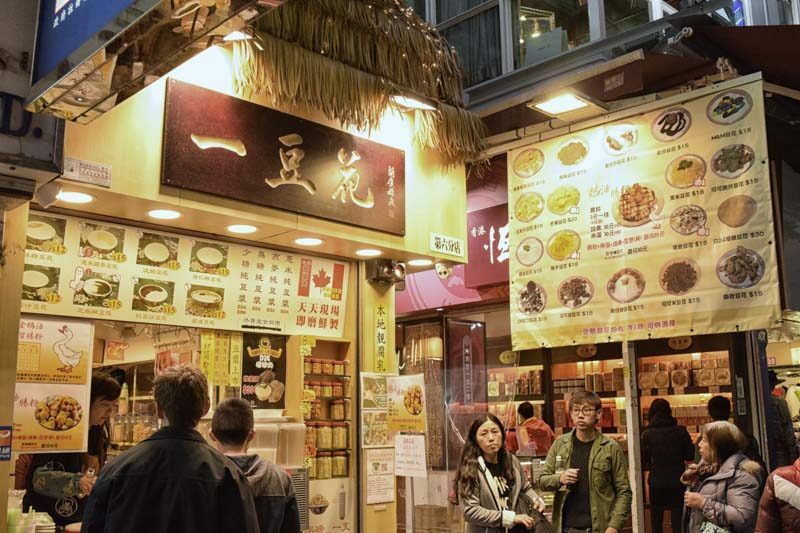 Walk along the crowded streets of Mong Kok and your senses are bound to be overwhelmed. A shoppers paradise, your ears will be full of touts from various stall owners persuading you to buy their Kånken backpacks for a mere 300HKD (You can bargain them down to about 75HKD). The neon lights EVERYWHERE will make you question why they are called night markets, and your olfactory glands are working overtime as the welcoming smells of deep fried goodies waft into your nose. The queue for this stall was circling around itself in Mong Kok. Located on a busy street corner, we were surprised as to how orderly the queue was. Generally one to balk at the innards of animals, I found myself surprised to be queuing up. Queues could never go wrong! The queue had moved like clockwork and apparently everyone knew what to get. Thankfully, we asked one of the locals in front of us to recommend me something and voila! we had an ensemble of innards to eat. He told me to get the mustard topping as well, to which we could not refuse. We had gotten the 3-in-1 combo of pig’s small intestines, lung and squid. Each of them came on a separate skewer and we were only set back 26 HKD! Even if you do not have a liking for innards of animals, this stall will change your mind. The deep marination and subtle flavours that were brought out in each of the skewers was amazing. The topping of a sweet barbecue sauce and spicy (almost wasabi-like) mustard enhanced the textures of each of the skewers. My favourite was the squid, which had a lingering smoky flavour and just the right amount of chewiness. 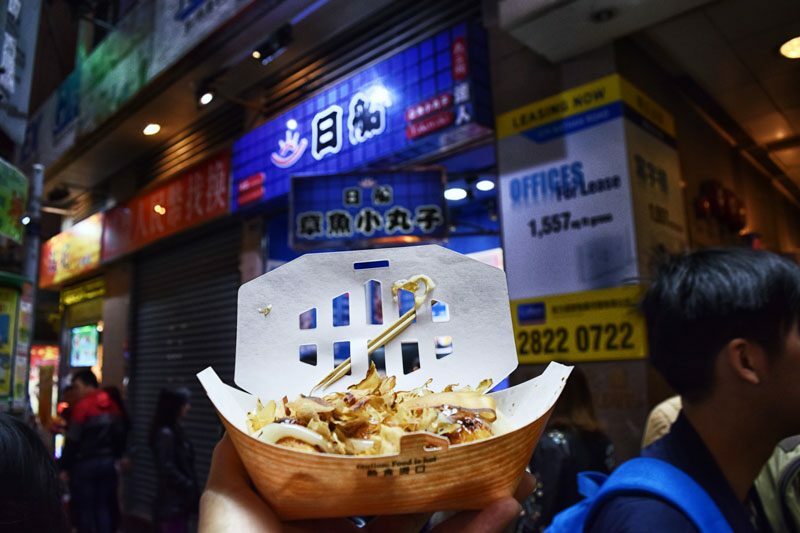 If you do find yourself in the streets of Mong Kok, you have to drop by for a snack! Also along the same street, we found this almost hidden bean curd stall. One of the locals had recommended this place to us and we decided to see if it was worth its salt. 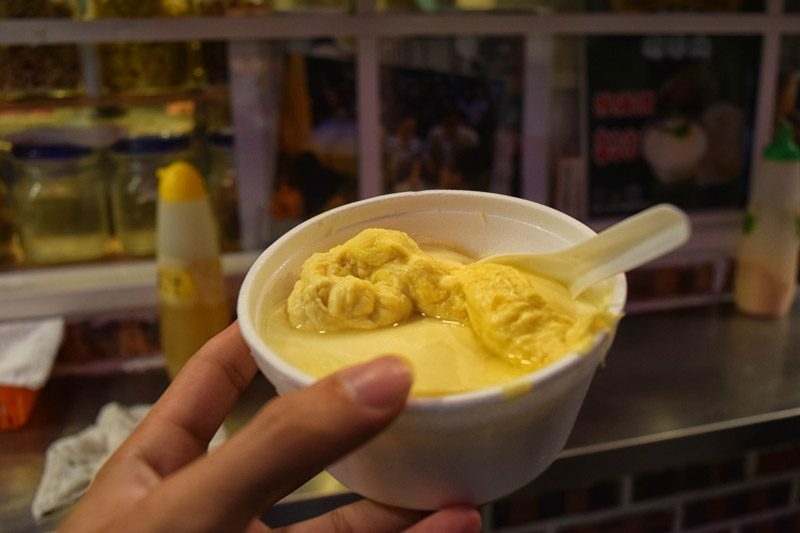 Having a huge craving for durian in the past week, I could feel myself salivating when I saw that they had bean curd (or as the locals call it), tau fu faa topped with D24 durian (30 HKD). That was amazing!? I immediately ordered myself one of those bad boys. The durian was surprisingly fresh, creamy on the inside, with the first bite sending me straight up to utopia. 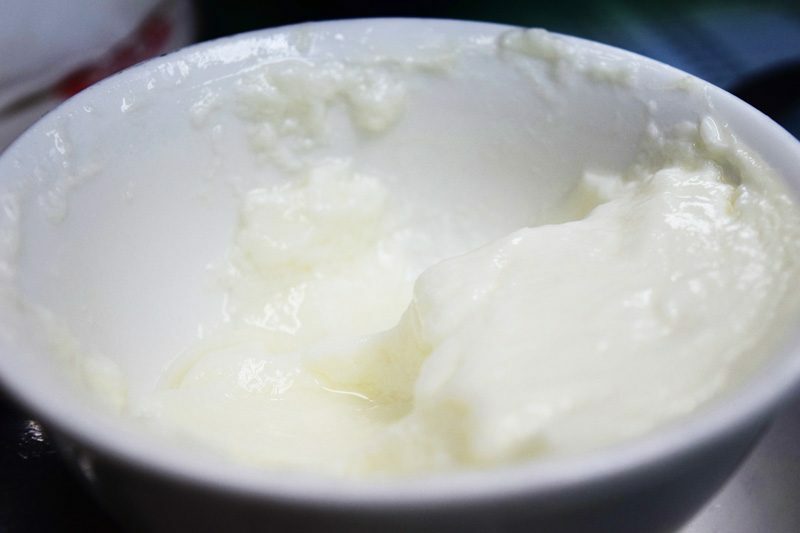 The bean curd in itself was amazingly silky and smooth. After I had slurped down the last bit of my bowl, I realised that this shop was amazingly stocked with western toppings for your bean curd as well. They had toppings from Maltesers to M&M’s, and even from walnuts to honey stars! You name it, they had it. 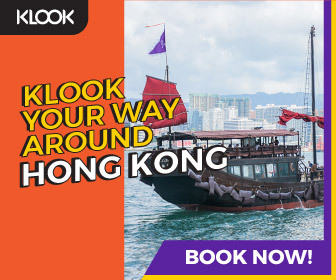 This truly symbolised the food culture of Hong Kong, serving you asian delicacies with a western twist! You have not had takoyaki, if you have not had it here. Gooey balls of delectable goodness smeared with teriyaki and cheese, emblazoned with heaps of fish flakes. 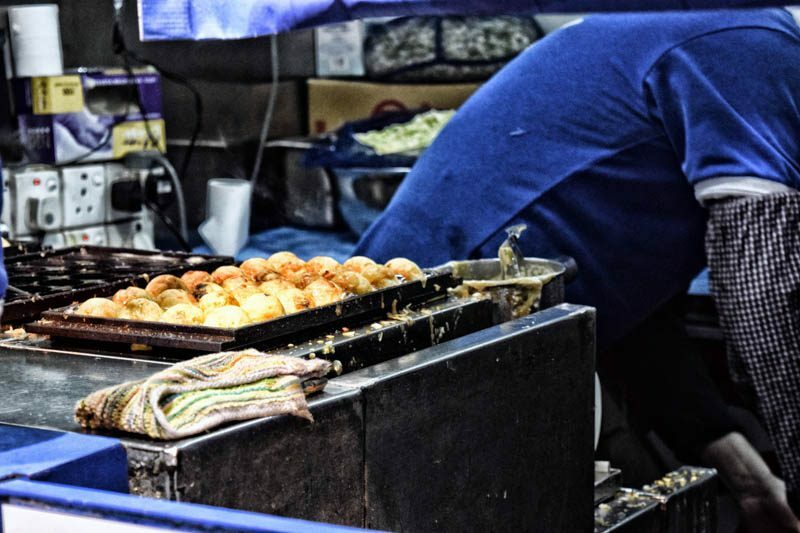 Japan Boat Takoyaki does it all. Just look out for a long queue winding around a neon blue sign. They sell takeaway bowls of Japanese pasta as well, but people come here mainly for the takoyaki. They have 5 sauces to choose from, original takoyaki, black pepper, egg-yolk dressing, wasabi and katsobushi. The egg-yolk dressing was our favourite, it was just the right amount of creamy to go well with the crunchy fish flakes and chewy takoyaki balls, the golden trifecta of takoyaki goodness we needed but did not deserve. The wasabi dressing was too intense for our liking, if you like to laugh in the face of danger, this would be the one for you. 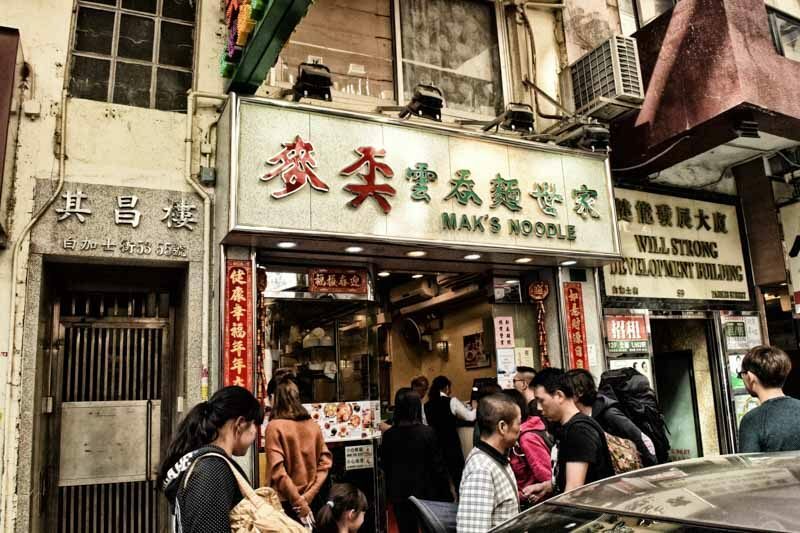 If you are willing to wait for 15 minutes for food, this would definitely be the best bet in Mong Kok for you. The light sweetness that accompanied the generous serving of octopus within the ball meant only one thing, it was really fresh! The only tip we can give you; do not get too excited when you get your portion. Scalding your tongue is not the best feeling in the world. 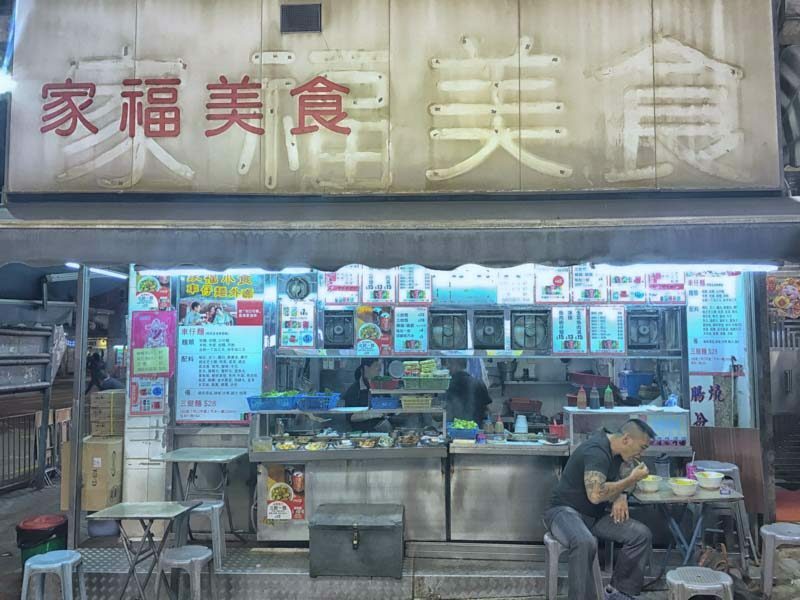 People have mentioned before that Hong Kong has grown so quickly and diversified so much in recent years that it is losing the culture it once had. Quick to adopt western ideals and lifestyles, this can be seen with the fast disappearing Dai Pai Dongs. However, as the old gives way to the new, you realise that the Hong Kongese way of life still lives on. 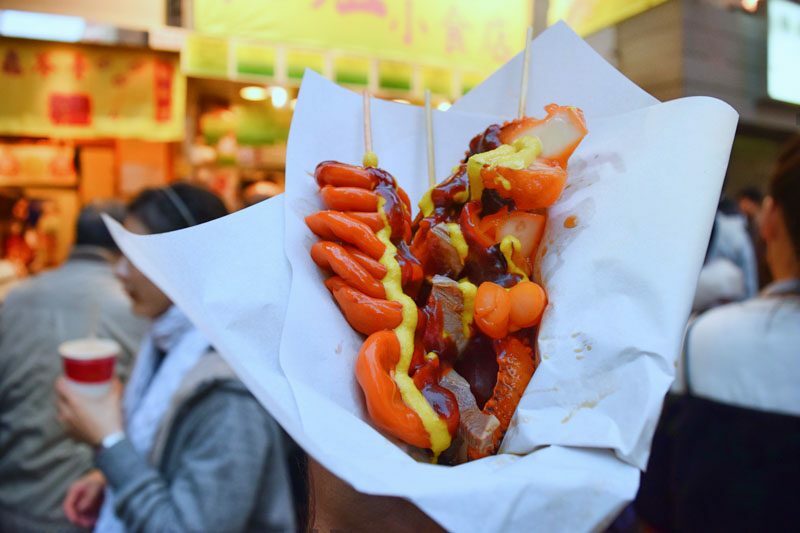 Join us as we discover Hong Kong’s street food culture, and we promise to leave your mouth watering and bellies full when you visit these places.